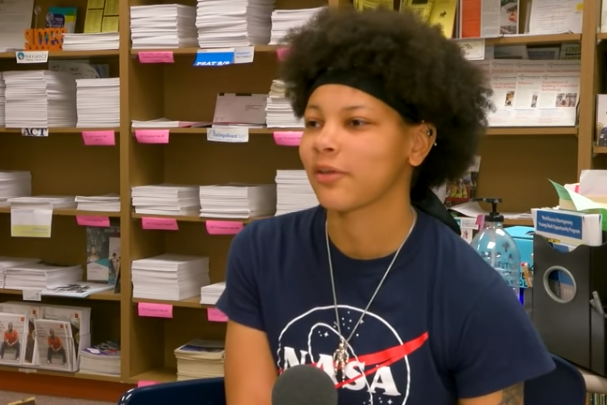 Ever since kindergarten, Clarksburg High School senior Sienna Williams has been determined to become an astronaut, and she is finding out years of hard work were worth it. In an interview with Montgomery Community Media’s Jordan Lindsay this month, Williams said she has been accepted by 11 of the 13 universities she applied to: Harvard, Princeton, Brown, Columbia, Cornell, Duke, U.Md., MIT, U.Penn, Virginia Tech and Yale, a list which includes almost every Ivy League school. Needless to say, Williams,who has a total of nearly $300,000 in scholarship offers, has plenty of options. And she is one step closer to joining the select who few who have voyaged to the final frontier. “One thing that’s motivating me is the lack of black females that I see in this field; it’s definitely pushed me to add to the diversity of astronauts and represent my community,” Williams told MC Media, adding that she looks forward to going out into space, turning around, and gazing upon the Earth from above far above. For Williams, getting to this point was no small feat. Over the course of her high school career, Williams has taken 19 AP-level courses, enrolled in the National Honor Society and competed on Clarksburg High’s soccer, basketball and softball teams — all while maintaining a part-time job. Williams hasn’t made a final decision on which school to attend — she has a long itinerary of campus visits planned for the next month — but she is currently leaning toward MIT.